Zinedine Zidane has officially been announced as Real Madrid’s manager again, replacing Santiago Solari after a poor run of form. The Spanish giants have just announced the news on their official website, confirming Zidane has come back to the Bernabeu on a contract running until 2022. The French tactician only left his job with Los Blancos at the end of last season, following a hugely successful spell in charge. 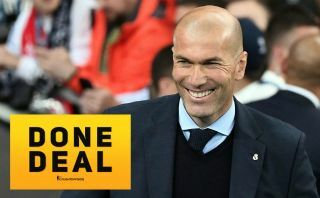 In less than three full seasons at the helm, Zidane won three Champions League finals and one La Liga title with Real, enhancing his already-legendary status at the club from his playing days there. Zidane is now set to earn another shot at reviving Madrid, who have had a dire season under first Julen Lopetegui and then Solari. The Independent claim Zidane has been lured back with the promise of a major overhaul in the transfer market this summer, which will apparently see big names like Chelsea’s Eden Hazard and PSG duo Neymar and Kylian Mbappe targeted. Real fans will surely be thrilled with this as it looks like the change needed to get them back to their dominant best again. It’s a blow for other clubs, however, with Chelsea thought to have been close to agreeing a deal to hire the 46-year-old to replace Maurizio Sarri, according to a recent report from the Sun. It was also not so long ago that the Evening Standard listed him as among the potential candidates for Manchester United.